Suitable for ages 4 years and up. Contains small parts. I bought this for my 7yrs old. 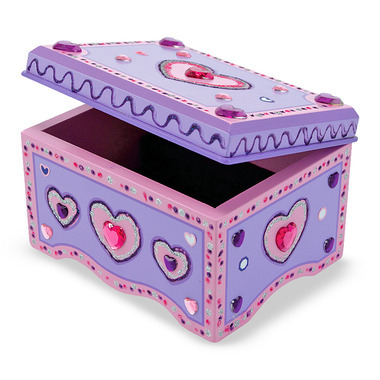 She is excited to have her own jewelry box. She enjoyed decorating it. 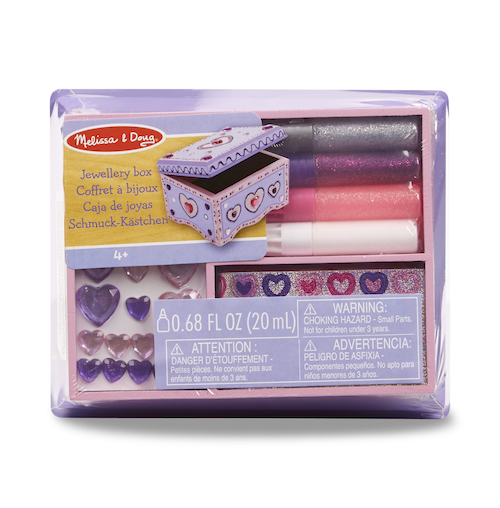 Gems are adhesive, so she didnâ€™t need the craft glue that is included in the package. Unfortunately the tray which holds the glues and stuff doesnâ€™t seem to be meant to fit in the box, because the size is too big for that. I wish it was able to be used as an inner tray for the box though. The idea is fantastic, execution is poor. Two pieces provided with the box donâ€™t fit inside. One is a purple foam that I believe is meant to hold rings. The second is a â€˜separatorâ€™ is too large. My daughter still enjoyed decorating the box. Great quality and price. My nieces will love this! Quality product- like all Melissa and Douglas products. Grear price point and excellent actvity.